For content to be searchable, it must exist in CDH and be indexed. Content can either already exist in CDH and be indexed on demand, or it can be updated and indexed continuously. To make content searchable, first ensure that it is ingested or stored in CDH. Flume, a flexible, agent-based data ingestion framework. A copy utility such as distcp for HDFS. Sqoop, a structured data ingestion connector. In a typical environment, administrators establish systems for search. 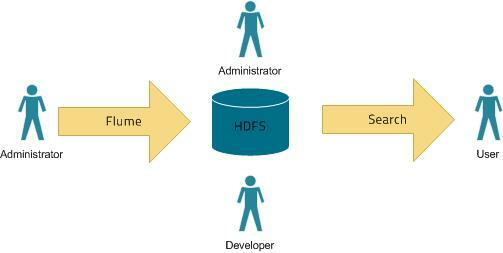 For example, HDFS is established to provide storage; Flume or distcp are established for content ingestion. After administrators establish these services, users can use ingestion tools such as file copy utilities or Flume sinks. Extraction, transformation, and loading (ETL) - Use existing engines or frameworks such as Apache Tika or Cloudera Morphlines. Indexes are typically stored on a local file system. Lucene supports additional index writers and readers. One HDFS-based interface implemented as part of Apache Blur is integrated with Cloudera Search and has been optimized for CDH-stored indexes. All index data in Cloudera Search is stored in and served from HDFS. To use MapReduce to index documents, run a MapReduce job on content in HDFS to produce a Lucene index. The Lucene index is written to HDFS, and this index is subsequently used by search services to provide query results. Batch indexing is most often used when bootstrapping a search cluster. The Map component of the MapReduce task parses input into indexable documents, and the Reduce component contains an embedded Solr server that indexes the documents produced by the Map. You can also configure a MapReduce-based indexing job to use all assigned resources on the cluster, utilizing multiple reducing steps for intermediate indexing and merging operations, and then writing the reduction to the configured set of shard sets for the service. This makes the batch indexing process as scalable as MapReduce workloads. Flume events are typically collected and written to HDFS. Although any Flume event can be written, logs are most common. Cloudera Search includes a Flume sink that enables you to write events directly to the indexer. This sink provides a flexible, scalable, fault-tolerant, near real-time (NRT) system for processing continuous streams of records to create live-searchable, free-text search indexes. Typically, data ingested using the Flume sink appears in search results in seconds, although you can tune this duration. The Flume sink meets the needs of identified use cases that rely on NRT availability. Data can flow from multiple sources through multiple flume hosts. These hosts, which can be spread across a network, route this information to one or more Flume indexing sinks. Optionally, you can split the data flow, storing the data in HDFS while writing it to be indexed by Lucene indexers on the cluster. In that scenario, data exists both as data and as indexed data in the same storage infrastructure. The indexing sink extracts relevant data, transforms the material, and loads the results to live Solr search servers. These Solr servers are immediately ready to serve queries to end users or search applications. This flexible, customizable system scales effectively because parsing is moved from the Solr server to the multiple Flume hosts for ingesting new content. Search includes parsers for standard data formats including Avro, CSV, Text, HTML, XML, PDF, Word, and Excel. You can extend the system by adding additional custom parsers for other file or data formats in the form of Tika plug-ins. Any type of data can be indexed: a record is a byte array of any format, and custom ETL logic can handle any format variation. In addition, Cloudera Search includes a simplifying ETL framework called Cloudera Morphlines that can help adapt and pre-process data for indexing. This eliminates the need for specific parser deployments, replacing them with simple commands. Search supports routing to multiple Solr collections to assign a single set of servers to support multiple user groups (multi-tenancy). Search supports routing to multiple shards to improve scalability and reliability. Index servers can be collocated with live Solr servers serving end-user queries, or they can be deployed on separate commodity hardware, for improved scalability and reliability. Indexing load can be spread across a large number of index servers for improved scalability and can be replicated across multiple index servers for high availability. This flexible, scalable, highly available system provides low latency data acquisition and low latency querying. Instead of replacing existing solutions, Search complements use cases based on batch analysis of HDFS data using MapReduce. In many use cases, data flows from the producer through Flume to both Solr and HDFS. In this system, you can use NRT ingestion and batch analysis tools. Extract content from the document contained in HDFS, where the document is referenced by a URL. Map the content to fields in the search schema. Create or update a Lucene index. This is useful if you index as part of a larger workflow. For example, you could trigger indexing from an Oozie workflow. After data is available as an index, the query API provided by the search service allows direct queries to be completed or to be facilitated through a command-line tool or graphical interface. Cloudera Search provides a simple UI application that can be deployed with Hue, or you can create a custom application based on the standard Solr API. Any application that works with Solr is compatible and runs as a search-serving application for Cloudera Search, because Solr is the core.